Cover art by Frank Harry. Mystery of the House of the Seven Gables starring Wonder Woman, script by William Moulton Marston [signed as Charles Moulton], art by Harry G. Peter; Diana and Steve head out by car to the New England coast at General Darnell's request to keep an eye out for spies and saboteurs; The disappearance of a young boy named Tommy then leads Diana to try and locate him, and she discovers a group of 5th Columnists who are connected to the Nazis that are to come ashore as invaders. The Smell That Spelled J-A-I-L starring Red, White and Blue, script by Jerry Siegel, art by William Smith. Fact page on Columbus. Hitler Is a Bum! starring The Ghost Patrol, script by Ted Udall, art by Frank Harry. Fingers of Fate--Minute Movies, script and art by Ed Wheelan. The Scourge of the Seas starring Black Pirate, script by Ted Udall, art by Sheldon Moldoff. The Adventure of Luckless Lenore starring Green Lantern, script by Bill Finger, art by Lou Ferstadt. Crime Takes the Count starring Wildcat, script by Bill Finger, art by Irwin Hasen. Scribbly starring Scribbly, script and art by Sheldon Mayer. Crime's Birthday Party starring The Flash, script by Gardner F. Fox, art by Lou Ferstadt (signed as E. E. Hibbard). 96 pgs. $0.15. Cover price $0.15. Cover and page 1 re-attached with tape. From the Mt. Rainier Collection. 1st two pages detached. 2 small pieces missing from 1st page, slightly affects art. Cover detached, first and last pages coming loose at staples. Cover art by Frank Harry. Wanted by Hitler, Dead or Alive, script by William Moulton Marston, art by Frank Godwin; Diana Prince is sitting at her desk one day when a woman enters, posing as a reporter, and asks very personal questions about Wonder Woman; Sensing something is wrong, Diana refuses to answer questions, but Steve Trevor is taken in, not realizing the woman is a Nazi agent, Fausta Grables; She eventually steals Wonder Woman's costume and poses as her for an Army benefit show. The Haunted Tank starring Ghost Patrol, script by Ted Udall, art by Frank Harry. They Wind Up in the Doghouse starring Black Pirate and Son, script by Ted Udall, art by Sheldon Moldoff. Covered Caravan--Minute Movies, script and art by Ed Wheelan. Mutt and Jeff strips, script and art by Al Smith [signed as Bud Fisher]. Handsome John Riley.... starring Green Lantern, script by Bill Finger, art by Jon Chester Kozlak. The Story Behind the Bellyache starring Wildcat / comic story, script by Bill Finger, art by Irwin Hasen. Punk Junk starring Red, White and Blue, script by Ted Udall, art by Joe Gallagher. The City on Wheels starring The Flash, script by Gardner F. Fox, art by Lou Ferstadt [signed as E. E. Hibbard]. Superman by George Lowther article. 96 pgs. $0.15. Cover price $0.15. Cover art by Frank Harry. The Invisible Invader starring Wonder Woman, script by William Moulton Marston [signed as Charles Moulton], art by Harry G. Peter. Mutt and Jeff strips, scripts and art by Al Smith [signed as Bud Fisher]. The Guy Who Liked Bananas starring The King, script by Gardner F. Fox, art by Harry Lampert. Master Sgt. Meyer Levin, Bombardier and Hero starring Meyer Levin, script and art by Jon L. Blummer. A Little Savage Revenge starring Hop Harrigan, script and art by Jon L. Blummer. The Man Most Like to Succeed starring Sargon the Sorcerer, script by John B. Wentworth, art by Sheldon Moldoff. The Minute Man Answers the Call, script by M.C. Gaines, art by Sheldon Moldoff. The Bushmaster starring Green Lantern, script by Bill Finger, art by Stan Aschmeier [signed as Mart Nodell]. Balboa--Picture Stories from History, art by Sheldon Moldoff. The Laws of Pumpkin Center starring The Flash, script by Gardner F. Fox, art by Lou Ferstadt [signed as E. E. Hibbard]. 92 pgs. $0.15. Cover price $0.15. Cover art by Frank Harry. 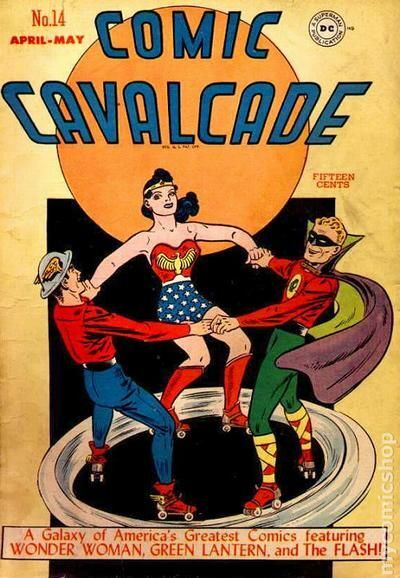 The Purloined Pressure Coordinator, script by William Moulton Marston (signed as Charles Moulton), art by Harry G. Peter; The Nazis try to steal Wonder Woman's new invention. Mutt & Jeff Gags/Cicero's Cat, script and art by Al Smith (signed as Bud Fisher). A Pair of Kings starring The King, script by Gardner F. Fox, art by Jon Chester Kozlak. The Biography of a Nazi starring The Gay Ghost, script by Ted Udall, art by Howard Purcell. Have You Read Any Good Books Lately? starring Green Lantern, pencils by Paul Reinman, inks by Sam Burlockoff. Mark Time, Mister! starring Hop Harrigan, script and art by Jon L. Blummer. Monty's Girlfriend starring Scribbly and the Red Tornado, script and art by Sheldon Mayer. The Man Who Wouldn't Put His Lights Out! starring O'Malley of the Fourth Precinct, script and art by Irwin Hasen. Turncoat Terrorism starring Sargon the Sorcerer, script by John B. Wentworth, art by Howard Purcell. Winky Turns Wrestler starring The Flash, script by Gardner F. Fox, pencils by Louis Ferstadt, inks by Martin Naydel. 92 pgs. $0.15. Cover price $0.15. Christmas cover art by Frank Harry. Mystery of the Crimson Flame starring Wonder Woman, script by William Moulton Marston (signed as Charles Moulton), art by Harry G. Peter. Mutt & Jeff Gags/Circero's Cat strips, script and art by Al Smith (signed as Bud Fisher). Technical Sgt. George Phillip Corl--Real Life Story, script and art by Jon L. Blummer. Combined Operations starring Hop Harrigan, script and art by Jon L. Blummer. Hold on to Your Hat starring Green Lantern, script by Alfred Bester, pencils by Paul Reinman, inks by Sam Burlockoff; While out for lunch one day, Doiby loses his derby when a fight suddenly ensues in the eating establishment he is in; While the Emerald Crusader tracks down the thugs responsible, Doiby tracks down his famous hat. Curious Case of the Missing Magic starring Sargon the Sorcerer, script by John B. Wentworth, art by Howard Purcell. The Pickpockets' Dilemma starring O'Malley of the Fourth Precinct, script and art by Irwin Hasen. Reel Life to Real Life starring Red, White and Blue, script by Ted Udall, art by Joe Gallagher. The Plant That Challenged the World starring The Flash, script by Gardner F. Fox, art by Martin Naydel. 92 pgs. $0.15. Cover price $0.15. Squarebound; cardboard cover. Cover art by Paul Reinman. The Mystery of Countess Mazuma, script by William Moulton Marston (signed as Charles Moulton, art by Harry G. Peter; The disappearance of several girls, including an intelligence agent, leads Wonder Woman to a secret diamond mine where the girls work as slaves. Mutt & Jeff Gags strips by Al Smith. In Humble Tribute to Tech Sgt. James G. Kehoe--Real Life Story, script and art by Jon L. Blummer. Sometimes a Fella's Got to Fight His Evil Self starring Hop Harrigan, script and art by Jon L. Blummer. They Are Invincible, script by Alfred Bester, art by Paul Reinman; Writer Al Bester devises a hypothetical story to prove to his wife that Green Lantern and Doiby defeat their opposition by using their brains. Auction of Happiness starring Sargon the Sorcerer, art by Howard Purcell. Local Boy Missing in Action starring Red, White and Blue, art by Joe Gallagher. Topsy Turvy Town starring The Flash, script by Gardner F. Fox, pencils by Stan Aschmeier, inks by Jon Chester Kozlak. Wonder Woman for Paper Salvage public service announcement, art by Harry G. Peter. 84 pgs. $0.15. Cover price $0.15. Published Jun 1944 by DC. Cover art by Frank Harry. The Vulture's Nest! 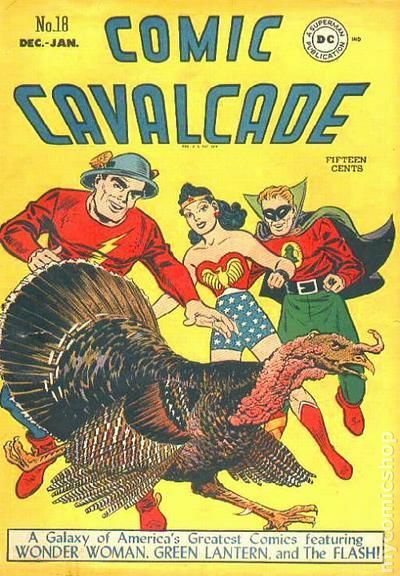 starring Wonder Woman, script by William Moulton Marston [as Charles Moulton], art by Harry G. Peter. Mutt & Jeff Gags strips by Al Smith [as Bud Fisher]. Scribbly and the Red Tornado, art by Sheldon Mayer. 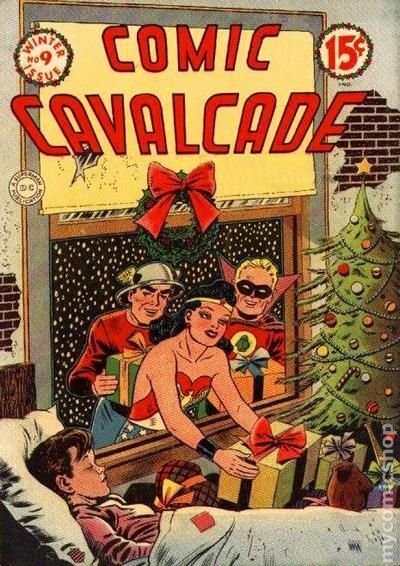 Etta Candy and the Holiday Girls, script nu William Moulton Marston [as Charles Moulton], art by Harry G. Peter. Against the Bloody Dragon starring Hop Harrigan, art by Jon L. Blummer. Fantastic Fate of the Fraternity Felons starring Green Lantern, script by Alfred Bester, art by Martin Nodell; When Doiby tells Alan that he plans to attend a fraternity reunion, he is unaware that these individuals plan to dupe Doiby and use him in the commission of crimes. The Queen's Mission starring The Black Pirate, art by Sheldon Moldoff. Behind the Lines starring Red, White and Blue, art by Joe Gallagher. The Man with the Notorious Nose starring The Flash, script by Gardner F. Fox, art by Martin Naydel. 84 pgs. $0.15. Cover price $0.15. 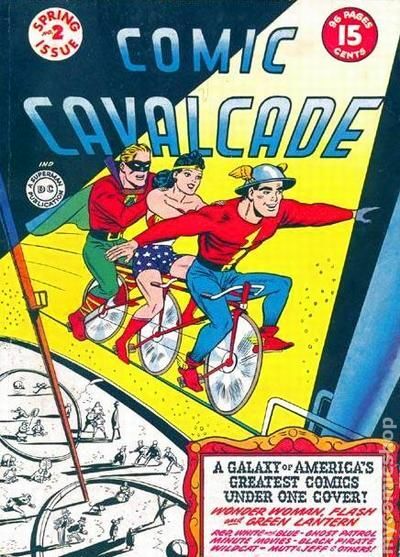 Published Sep 1944 by DC. Cover art by Frank Harry. 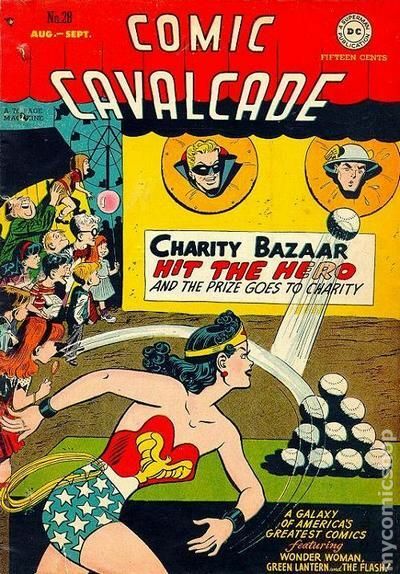 The Amazon Bride, script by William Moulton Marston [as Charles Moulton], art by Harry G. Peter; Wonder Woman is drugged by gangsters, and that night she dreams that she has lost her Amazon powers, so agrees to marry Steve. Mutt and Jeff strips by Al Smith [as Bud Fisher]. The Twain Shall Meet--History Feature, script by M. C. Gaines, art by Dennis Neville. Is the Kid a Killer? starring Green Lantern, script by Alfred Bester, art by Paul Reinman. Heroes in Dungarees--East-West Story, art by Dennis Neville. The Psalm of the K Ration starring Hop Harrigan, script and art by Jon L. Blummer. The Story of Prince Henry--Picture Stories from American History, script by M. C. Gaines, art by Don Cameron. The Man Who Tilted Windmills starring The Flash, script by Gardner F. Fox, art by Jon Chester Kozlak. Green Lantern for Paper Salvage public service announcement, art by Paul Reinman. 84 pgs. $0.15. Cover price $0.15. 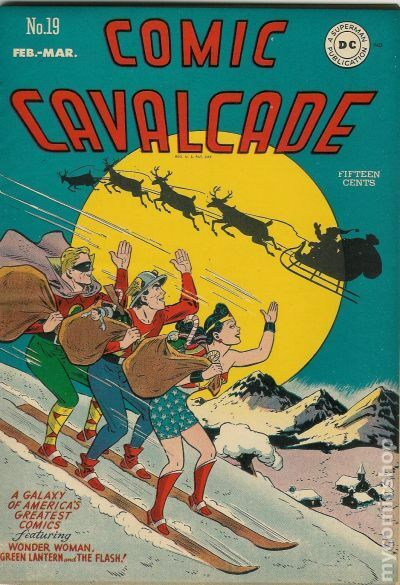 Published Dec 1944 by DC. Cover art by Everett E. Hibbard. 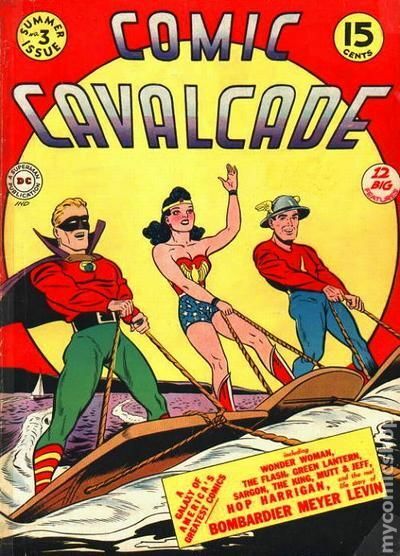 The Subsea Pirates starring Wonder Woman, script by William Moulton Marston [as Charles Moulton], art by Harry G. Peter; Steve Trevor investigates a report that a school of mermaids have sunk a ship, and he ends up being captured by them. Mutt and Jeff strips by Al Smith [as Bud Fisher]. Join the Junior Justice Society of America ad. A Tale of a City starring Green Lantern, script by Henry Kuttner, art by Paul Reinman; During a pre-Christmas radio program, racial and religious persecution raises its ugly head, prompting Alan Scott to use a life-and-death situation involving Doiby as an example of what America really stands for. Filipinos Are People--East-West Story, art by Dennis Neville. A Ride in the Sky starring Hop Harrigan, art by Jon L. Blummer. The Tale of the Winged Horse starring The Flash, script by Gardner F. Fox, art by Jon Chester Kozlak. 84 pgs. $0.15. Cover price $0.15. 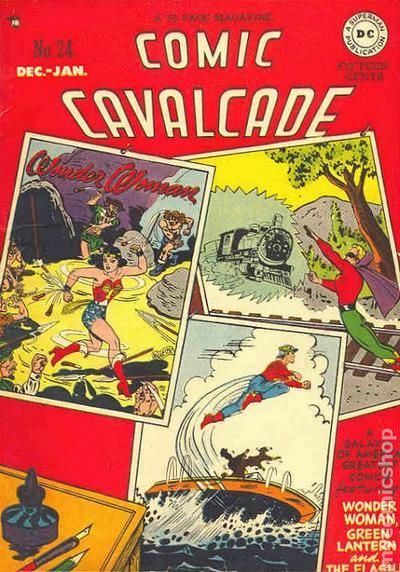 Published Mar 1945 by DC. Cover art by Everett E. Hibbard. The Great Blue Father, script by William Moulton Marston (signed as Charles Moulton), art by Harry G. Peter; A scientist by the name of Professor Proto Plasm invents a "moron hormone" that makes people simple-minded, including Steve Trevor and Wonder Woman. Mutt & Jeff Gags strips by Al Smith (signed as Bud Fisher). Tomorrow the World play adaptation, art by Everett E. Hibbard. The Man with the Missing Memory!, art by Jon Chester Kozlak; The Checker Mob and the Crime Syndicate are both after Professor Memory, a man who has been picked up by Doiby in his cab. Green Lantern's job is to discover why. The Story of the French and Indian War--Picture Stories from American History, script by M. C. Gaines, art by Don Cameron. The Dragon Dies in India starring Johnny Everyman, art by John Daly. The Elevator That Went Sideways starring The Flash, script by Gardner F. Fox, art by Everett E. Hibbard. 84 pgs. $0.15. Cover price $0.15. Published Jun 1945 by DC. Cover art by Everett E. Hibbard. The Cheetah Returns, script by Joyce Murchison, art by Harry G. Peter; Wonder Woman arrives in Paradise Island after being informed that the Cheetah had escaped and supposedly drowned in the ocean. Mutt & Jeff Gags strips by Al Smith [as Bud Fisher]. Two Characters in Search of a Brain starring Green Lantern, art by Jon Chester Kozlak; Two petty thieves kidnap a college professor in order to convince fellow criminals that they are the "brains" of their mob, and to cover up their theft of stolen funds. The Lucky Rings starring Hop Harrigan, art by Jon L. Blummer. Birds over China starring Johnny Everyman, art by John Daly. Whitey in Germany starring Red, White and Blue, script by John B. Wentworth, art by Dennis Neville. Shenanigans in Sherwood Forest starring The Flash, script by Gardner F. Fox, art by Martin Naydel. 76 pgs. $0.15. Cover price $0.15. 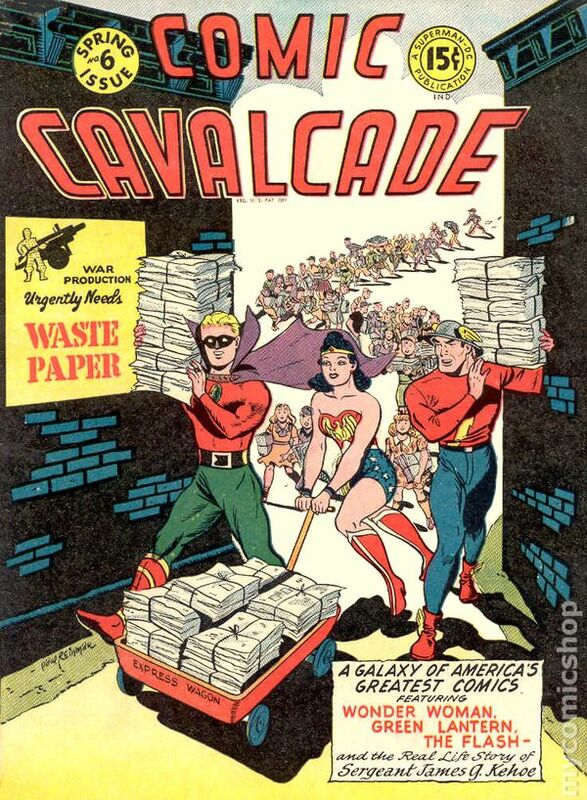 Published Sep 1945 by DC. Cover art by Everett E. Hibbard. Revolt on Paradise Island, script by Joyce Murchison, art by Harry G. Peter; While Wonder Woman is on Paradise Island showing films of her various exploits, one renegade Amazon escapes to the Man's World, later captures Steve Trevor and Wonder Woman, then forces the Amazon Princess to return her to Reform Island. Mutt & Jeff Gags strips by Al Smith [signed as Bud Fisher]. A Race against Time, script by Alfred Bester, art by Jon Chester Kozlak; Green Lantern and Doiby race against the clock to locate the future victim of a murder that they overheard two killers planning. The Adventure of the Million Dollar Parcel starring Hop Harrigan, script and art by Jon L. Blummer. Meet Charley Wing starring Johnny Everyman, art by John Daly. Whitey in Germany starring Red, White and Blue, script by John B. Wentworth, art by Dennis Neville. Painting the Town starring The Flash, script by Gardner F. Fox, art by Martin Naydel. 76 pgs. $0.15. Cover price $0.15. 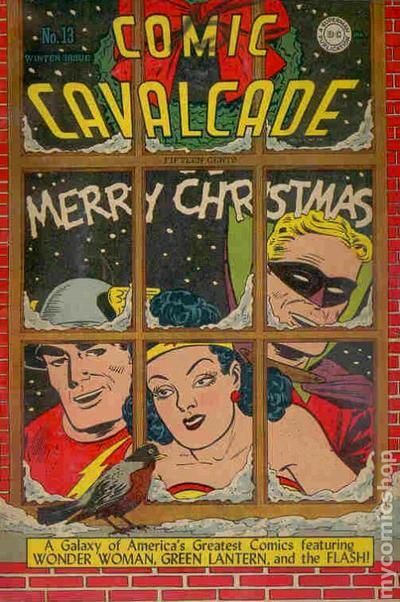 Published Dec 1945 by DC. Cover art by Everett E. Hibbard. The Underwater Folly s starring Wonder Woman, script by Joyce Murchison, art by Harry G. Peter. Meat on the Hoof starring Johnny Everyman, art by John Daly. And Then There Was One starring Green Lantern, script by Alfred Bester, art by Paul Reinman; one of the Tibetan Lamas that originally gave the Green Lamp to Alan Scott, appears to warn Master of Light of the return of his greatest foe: Solomon Grundy. Carl Akeley...He Brought Us Africa--Picture Stories From Natural History, art by Dennis Neville. The Corpse in the Shroud Lines starring Hop Harrigan, script and art by Jon L. Blummer. 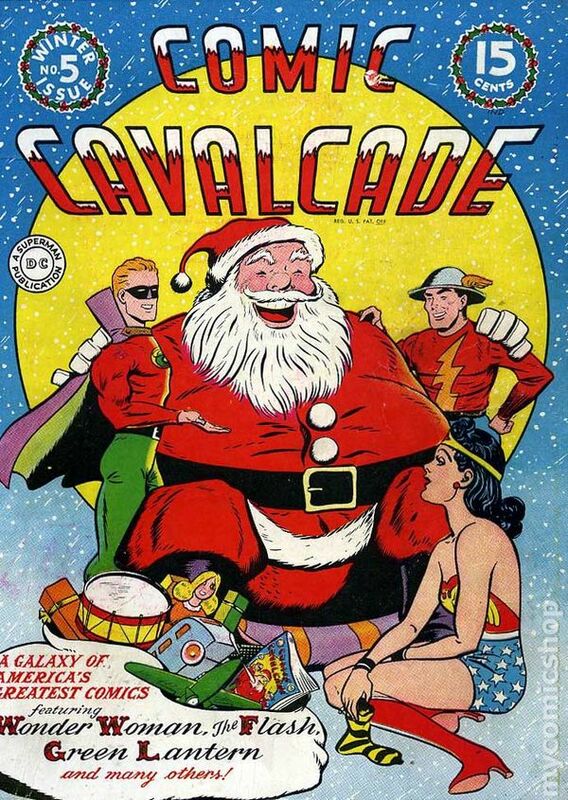 The Story of the First Santa Claus, script by Gardner F. Fox, art by Jon Chester Kozlak; At the annual Christmas dinner meeting of the Liar's Club, Jay Garrick tells the group how the Flash discovered Santa Claus! 76 pgs. $0.15. Cover price $0.15. 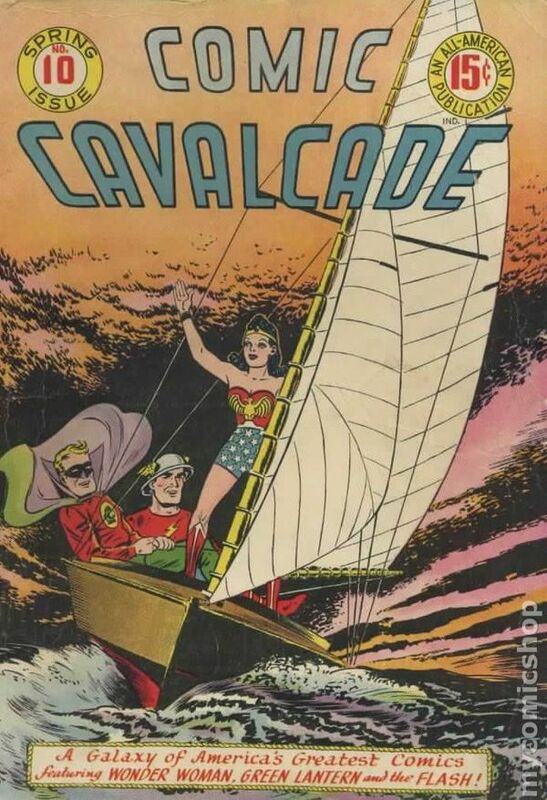 Published May 1946 by DC. Cover art by Everett E. Hibbard. The Severed Bracelets starring Wonder Woman, script by William Moulton Marston (signed as Charles Moulton), art by Harry G. Peter. All Men Are Brothers starring Johnny Everyman, art by John Daly. Voice in the Sky starring Hop Harrigan, script and art by Jon L. Blummer. The Fourth Dimensional House starring The Flash, script by Gardner F. Fox, art by Jon Chester Kozlak; At another meeting of the Liar's Club, Jay Garrick tells of a fantastic house built by the Three Dimwits that has a doorway to another dimension, windows to the cosmos, trapdoors to a thousand worlds, and stairways to the stars! The Flying Furniture starring Sargon the Sorcerer, script by John B. Wentworth, art by Sheldon Moldoff. Mayhem Comes to Town starring Green Lantern, art by Jon Chester Kozlak; Two big game hunters, fresh back from a big game hunt, take on each other in order to land the leading role in a film about Africa. 76 pgs. $0.15. Cover price $0.15. 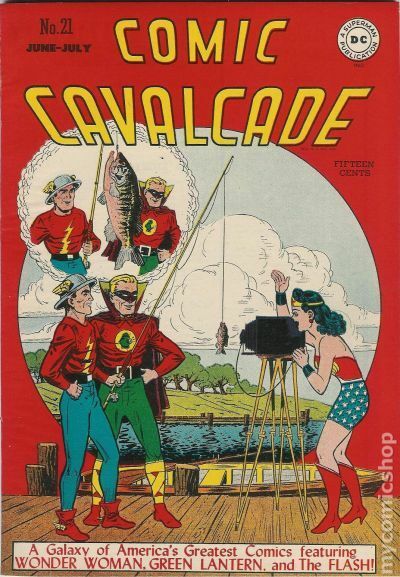 Published Jul 1946 by DC. Cover art by Frank Harry. Flaming Fury, script by Joyce Murchison, art by Harry G. Peter; Wonder Woman investigates mysterious forest fires on land owned by Nancy Reardon, and discovers the Nancy's fiance, Sam, and a rival land owner are responsible for the blazes. Mutt & Jeff Gag Pages strips by Al Smith (signed as Bud Fisher). The Man That Time Forgot--Just a Story / comic story, script and art by Howard Purcell. Spend Till It Hurts starring The Flash, script by Gardner F. Fox, art by Jon Chester Kozlak. Oswald the Ogre--Foney Fairy Tales, script and art by Ed Wheelan. Puzzles, Planes and Machine Gun Bullets starring Hop Harrigan, script and art by Jon L. Blummer. The Human Key starring Green Lantern, art by Paul Reinman; Some very enterprising crooks discover a young man who has the unusual trait of being able to open any lock made....a trait they hope to cash in on! 76 pgs. $0.15. Cover price $0.15. 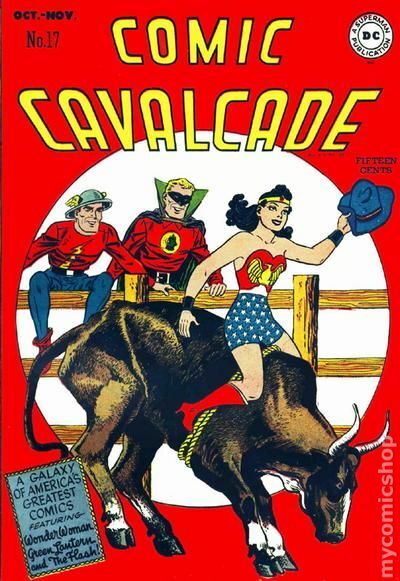 Published Sep 1946 by DC. Cover art by Everett E. Hibbard. The Battle of Desires, script by William Moulton Marston (signed as Charles Moulton), art by Harry G. Peter; Badly beaten by his father for destroying public property, delinquent Don Elliot is taken by Wonder Woman to Paula's lab to confront the wrong desires within him, and decides to make the change to control those desires in the future. Oswald the Ogre--Foney Fairy Tales, script and art by Ed Wheelan. 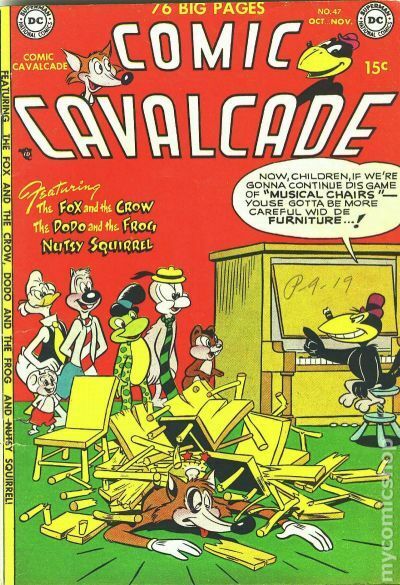 Pound the Ivories, Pal, script by Gardner F. Fox, art by Martin Naydel; Curt Ronald had a powerful ambition: to play the piano in the Barry Brown Band. For a while, his ambition seemed pretty tough to satisfy, until the Flash stepped in. The Tale of Timothy Wiggins--Just a Story, script and art by Howard Purcell. The Black Dragoons starring Hop Harrigan, script and art by Jon L. Blummer. The Headstrong Heads starring Green Lantern, art by Paul Reinman. Mutt and Jeff strips by Al Smith (signed as Bud Fisher). 76 pgs. $0.15. Cover price $0.15. 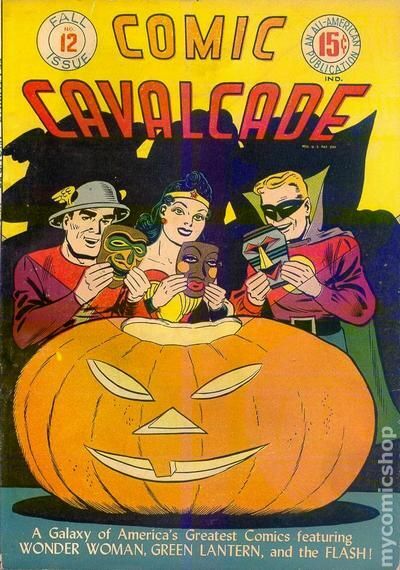 Published Nov 1946 by DC. Cover art by Everett E. Hibbard. The Valkyries' Prey starring Wonder Woman, script by William Moulton Marston (signed as Charles Moulton), art by Harry G. Peter. Mutt and Jeff strips by Al Smith (signed as Bud Fisher). The Flying Tractor starring The Flash, script by Gardner F. Fox, art by Martin Naydel; Noddy Toylan receives news that his Uncle Hezekiah has died, and that he left Noddy an estate, one that literally falls apart on the Three Dimwits. Foney Fairy Tales, script and art by Ed Wheelan. Still Life in the Hills, or, The Still Fills the Bill starring Hop Harrigan, script and art by Jon L. Blummer. Da Social Lion starring Green Lantern, script by Alfred Bester, art by Paul Reinman. 76 pgs. $0.15. Cover price $0.15. 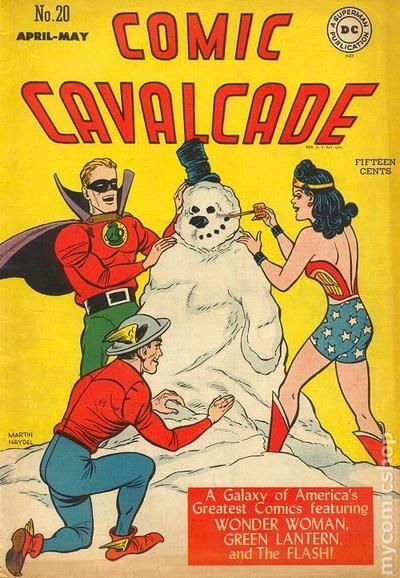 Published Jan 1947 by DC. Cover art by Everett E. Hibbard. The Menace of the Rebel Manlings, script by Joyce Murchison, art by Harry G. Peter; Wonder Woman and Octavis are taken prisoner aboard a submarine controlled by Manilus, a former lab assistant who was exposed to Vitamin Z gas, which enlarged his brain; He has taken over Atlantis and now plans to conquer the world. Mutt and Jeff strips by Al Smith (signed as Bud Fisher). 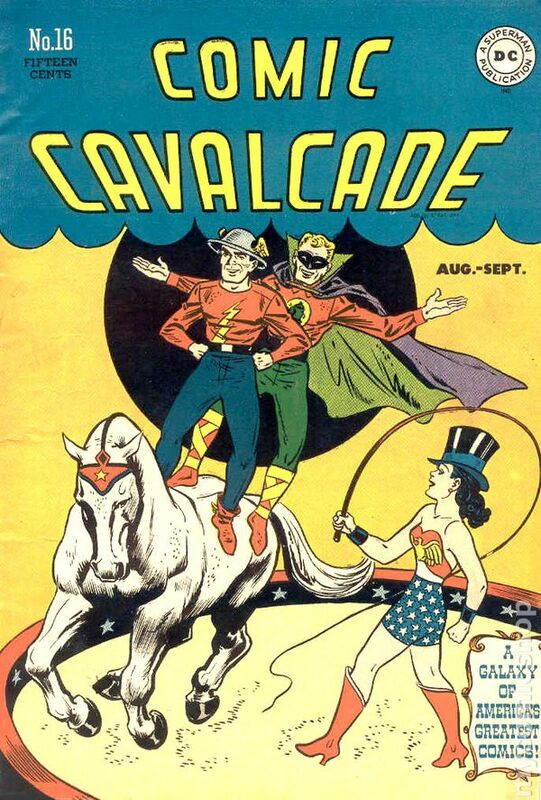 The Galloping Greenbacks starring The Flash, art by Everett E. Hibbard. Foney Fairy Tales, script and art by Ed Wheelan. Detour--Just a Story, script and art by Howard Purcell. Seek and Hide, or, The Airmail Trail starring Hop Harrigan, script and art by Jon L. Blummer. The Meaning of 'D' starring Green Lantern, art by Paul Reinman. 76 pgs. $0.15. Cover price $0.15. 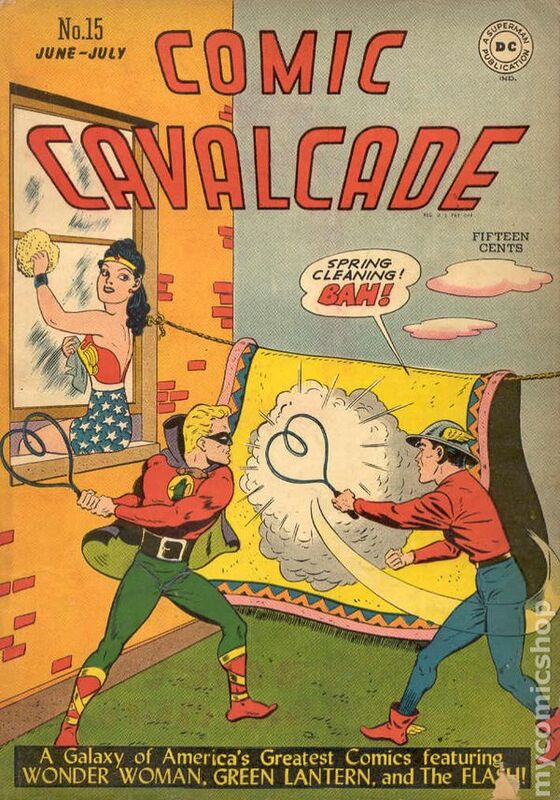 Published Mar 1947 by DC. Cover art by Everett E. Hibbard. The Battle for Eternal Youth starring Wonder Woman, script by William Moulton Marston (signed as Charles Moulton), art by Harry G. Peter; Gangster Ambrose Venture seeks to obtain the secret of eternal youth from the Amazons, and hires Roba Jewel to gain access to Paradise Island and steal the waters of the Fountain of Youth. Mutt and Jeff strips by Al Smith [as Bud Fisher]. 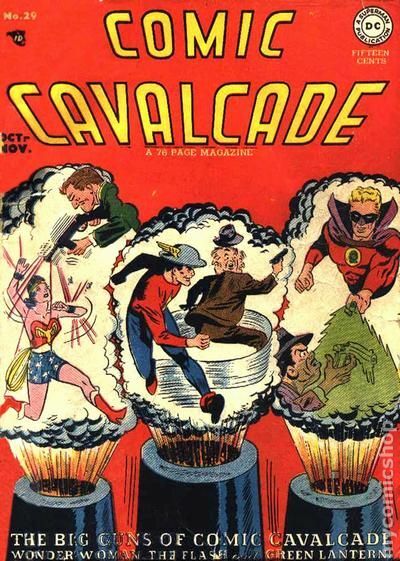 The Race Through Time, art by Everett E. Hibbard; As a session of the Liar's Club, Jay Garrick spins a yarn involving the Flash that begins in the present, goes back to prehistoric times, and ends up in the future with the end of the world! Foney Fairy Tales, script and art by Ed Wheelan. Mr. Nobody--Just a Story, script and art by Howard Purcell. The Fog-Shrouded Doom starring Hop Harrigan, script and art by Jon L. Blummer. Cotton-Top Katie story, script and art by Harry Lampert [as Harrielle]. Grin and Bear It starring Green Lantern, art by Paul Reinman. 76 pgs. $0.15. Cover price $0.15. 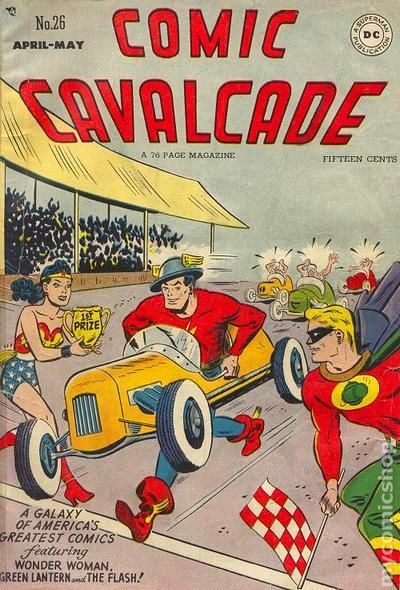 Published May 1947 by DC. Cover art by Martin Naydel. The Buddha Wishing Ring starring Wonder Woman, script by William Moulton Marston (signed as Charles Moulton), art by Harry G. Peter; An Army pilot returns to Intelligence HQ with a story about a magic ring that grants wishes; Both Steve and Etta make wishes, which do come true; However, Etta's wish leads to a revolution of the island of Zani. Mutt and Jeff strips by Al Smith (signed as Bud Fisher). The Most Expensive Marble in the World--Just a Story, script and art by Howard Purcell. Turnabout is Foul Play starring The Flash, art by Everett E. Hibbard. A Fish Story--Foney Fairy Tales, script and art by Ed Wheelan. Tank Tinker Deals in Crates starring Hop Harrigan, script and art by Jon L. Blummer. O'Malley Gets His Men starring O'Malley of the Fourth Precinct, script and art by Irwin Hasen. The Man Who Was First starring Green Lantern, art by Paul Reinman. 76 pgs. $0.15. Cover price $0.15. 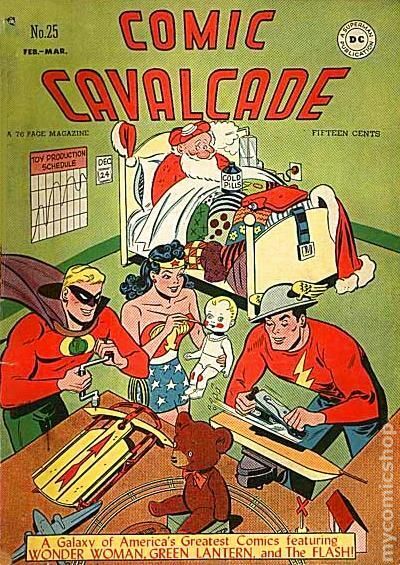 Published Jul 1947 by DC. Cover art by Everett E. Hibbard. The Siege of the Flying Mermaids, script by William Moulton Marston (signed as Charles Moulton), art by Harry G. Peter; Wonder Woman must battle an evil group of mermaids that were created from tiny sharks by a formula invented by Gerta, willful daughter of Paula von Gunther. Mutt and Jeff strips by Al Smith (signed as Bud Fisher). Behind the 8-Ball--Just a Story, script and art by Howard Purcell. The Making of a Reporter starring The Flash, art by Martin Naydel. Mixy Pixy Brews a Bruise starring Hop Harrigan, script and art by Jon L. Blummer. O'Malley the Cop starring O'Malley of the Fourth Precinct, script and art by Irwin Hasen. The Man Who Couldn't Fail starring Green Lantern, script by John Broome, art by Paul Reinman; Alan Scott is summoned to his old Alma Mater in an attempt to locate the "brain child" of the university who mysteriously disappeared. 76 pgs. $0.15. Cover price $0.15. 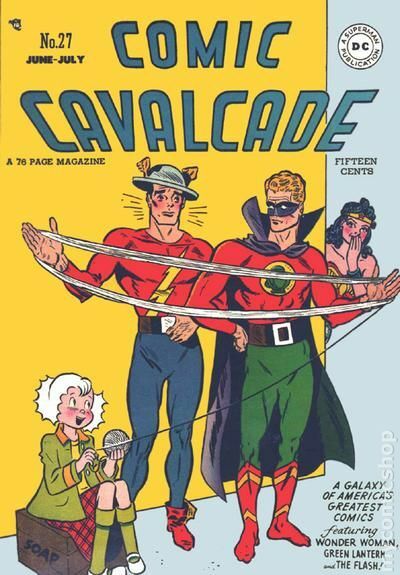 Published Sep 1947 by DC. Cover art by Martin Naydel. 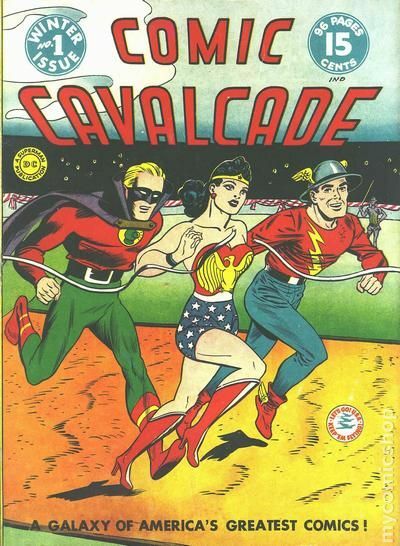 The Captives of Saturnette starring Wonder Woman, script by William Moulton Marston (signed as Charles Moulton), art by Harry G. Peter. Mutt and Jeff strips by Al Smith (signed as Bud Fisher). Crimes in Duplicate, script by John Broome, art by Howard Purcell; Green Lantern faces a rather unique adversary in Joe Mimic, who decides to repeat famous old crimes that failed for one reason or another, but now to do them over again successfully. The Kid by the Side of the Road starring Johnny Peril, script and art by Howard Purcell. Bloodhound Compass starring The Atom, script by Joseph Greene, art by Jon Chester Kozlak. Fate's Bait starring Hop Harrigan, script and art by Jon L. Blummer. Beware the Ice Age starring The Flash, art by Everett E. Hibbard. 80 pgs. $0.15. Cover price $0.15. 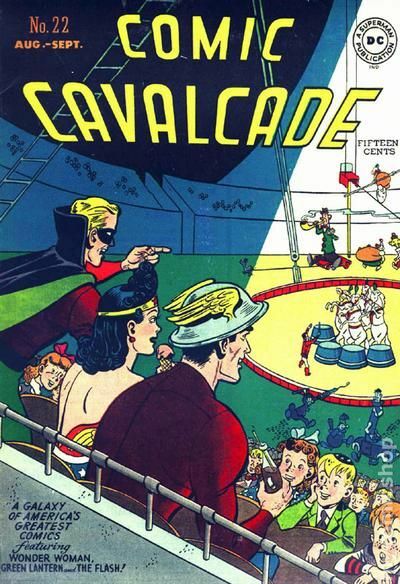 Published Nov 1947 by DC. This is really a charming cover! Cover art by Harry Lampert and Alexander Toth. Siege of the Iron Giants, script by Robert Kanigher, art by Harry G. Peter; Chief Loko requests the aid of Army Intelligence agents to battle a group of iron giants that are kidnapping members of his tribe; Wonder Woman exposes the giants as men dressed in iron suits, led by Dr. Psycho's geologist brother. Mutt and Jeff strips by Al Smith (signed as Bud Fisher). A Very Honorable Guy starring Johnny Peril, script and art by Howard Purcell. If Guns Could Only Talk starring Green Lantern, script by Robert Kanigher, pencils by Irwin Hasen, inks by John Belfi. The Most Popular Hat in the World starring The Atom, script by Joseph Greene, art by Jon Chester Kozlak. Raindrops Trip the Crime starring Hop Harrigan, script and art by Jon L. Blummer. The Sleeping City starring The Flash, art by Everett E. Hibbard. 80 pgs. $0.15. Cover price $0.15. 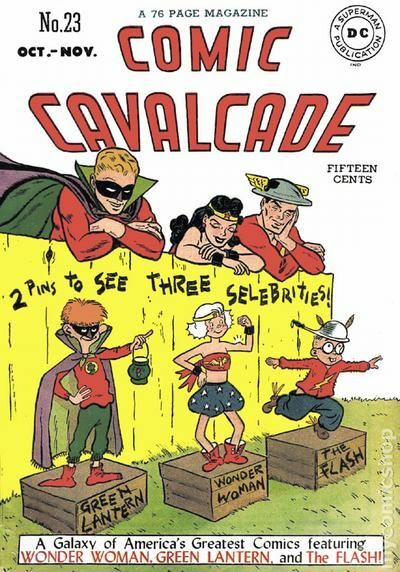 Published Jan 1948 by DC. Cover art by Irwin Hasen and Harry G. Peter. Empress of the Sea Brigands starring Wonder Woman, script by Robert Kanigher, art by Harry G. Peter. The Story of Professor Kendle starring Johnny Peril, script and art by Howard Purcell. Airfield Sabotage starring Hop Harrigan, art by Howard Purcell. I Think the Heat's Got Him! starring Cotton-Top Katie, script and art by Harry Lampert (signed as Harrielle). The Slow-Motion Crimes, script by Robert Kanigher, pencils by Carmine Infantino, inks by Frank Giacoia; The Turtle returns to confound Flash, this time by combining fast and slow words as clues to the crimes he plans to commit. To top things off, the Scarlet Speedster is saved from death by a member of the JSA! The Case of the Withered Flower, script by John Broome, pencils by Irwin Hasen, inks by John Belfi; Doiby's signal flare lures Green Lantern into a trap; After deciphering the clues, the Emerald Crusader discovers to his horror that Solomon Grundy has returned! 80 pgs. $0.15. Cover price $0.15. 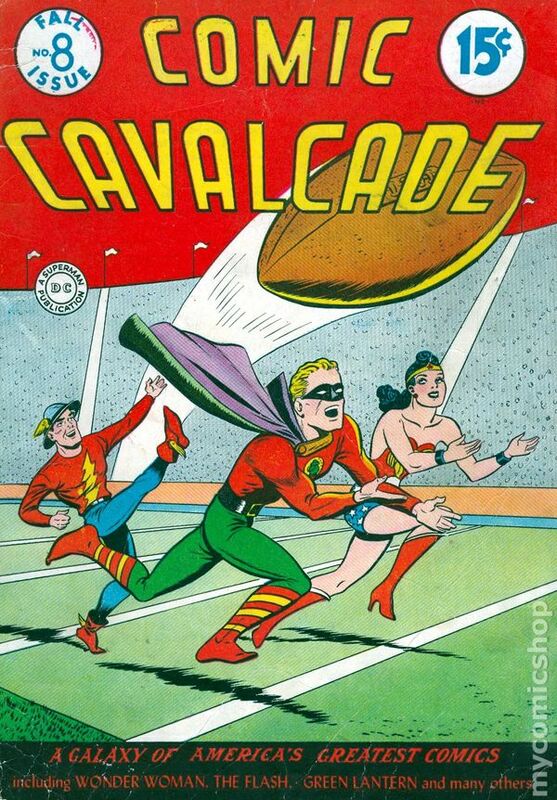 Published Mar 1948 by DC. Cover art by Bob Oksner. The Hatred of Badra, script by Robert Kanigher, art by Harry G. Peter; Badra survives the destruction of her home planet Hator by a weapon of mass destruction, and comes to the Earth, forms a criminal gang, and challenges Wonder Woman. Mutt and Jeff strips by Al Smith (signed as Bud Fisher). The Talking Dog starring Johnny Peril, script and art by Howard Purcell. The Roof of the World, art by Irwin Hasen; Green Lantern is convinced by the Sky Pirate that he is suffering from Altaphobia: the morbid fear of heights. The Perfessor Takes Tuba Lessons starring Cotton-Top Katie, script and art by Harry Lampert (signed as Harrielle). The Mystery of Airport Inn starring Hop Harrigan, art by Howard Purcell. Tune of Terror starring The Black Canary, script by Robert Kanigher, pencils by Carmine Infantino, inks by Joe Giella. The Return of Kiua starring The Flash, art by Carmine Infantino. 80 pgs. $0.15. Cover price $0.15. 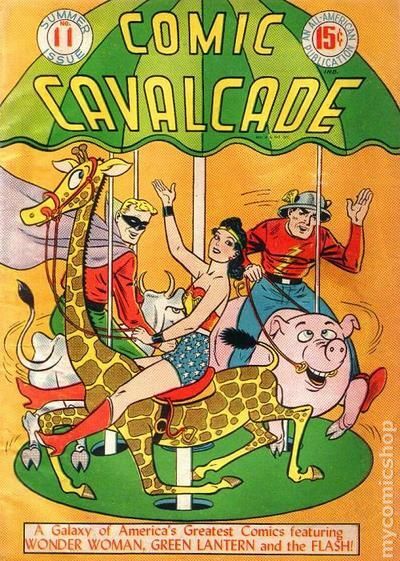 Published May 1948 by DC. Cover art by Bob Oksner. Deception's Daughter, script by Robert Kanigher, art by Harry G. Peter; When Womnder Woman intercepts a Martian spacecraft from crashing to Earth, out steps the daughter of the Duke of Deception; She captures Wonder Woman and forces her to build an underground base from which Lya intends to return to Mars and overthrow her father. Mutt and Jeff strips by Al Smith (signed as Bud Fisher). Doorway into Time starring Johnny Peril, script and art by Howard Purcell. Forecast: Danger, art by Alexander Toth; Green Lantern has a hard time convincing a young man to follow in his father's footsteps as a meteorologist until a storm threatens a ship carrying his fiancé. The Mysterious Box starring Cotton-Top Katie, script and art by Harry Lampert (signed as Harrielle). Riddle of the Useless Thefts starring Hop Harrigan, script by Jon L. Blummer, pencils by Arthur F. Peddy (signed), inks by Bernard Sachs. Crime Has Many Faces, script by Robert Kanigher, art by Carmine Infantino; The Flash takes a man back ten years on a trip through time to show him how his carelessness has caused death and destruction over the years. 80 pgs. $0.15. Cover price $0.15. 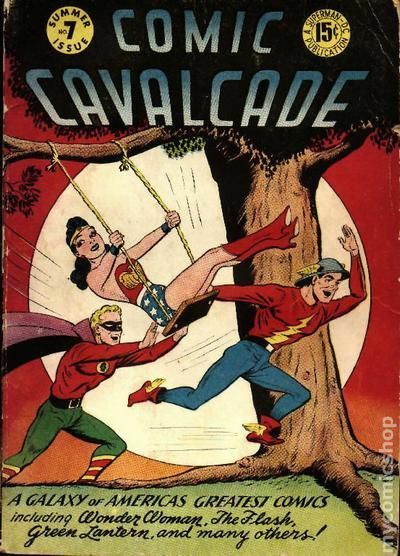 Published Jul 1948 by DC. 2 1/4" spine split from bottom. Cover art by Harry Lampert and Alexander Toth. Anti-Electric starring Wonder Woman, script by Robert Kanigher, art by Harry G. Peter; Steve and Diana are riding a train that is suddenly halted by power failure, and soon discover that a fantastic criminal is blackmailing the city with a device that can cancel electric power. Mutt and Jeff strips by Al Smith (signed as Bud Fisher). The Island of Little People starring Johnny Peril, script and art by Howard Purcell. The April Fool's Day Crimes starring Green Lantern, script by John Broome, art by Alexander Toth. Tex Rogers starring Cotton-Top Katie, script and art by Harry Lampert (signed as Harrielle). The Trees of Terror, art by Everett E. Hibbard; The Flash has one of his strangest adventures ever when he encounters a scientist who has the weird capability of transforming the energy of human beings into plant energy. 80 pgs. $0.15. Cover price $0.15. 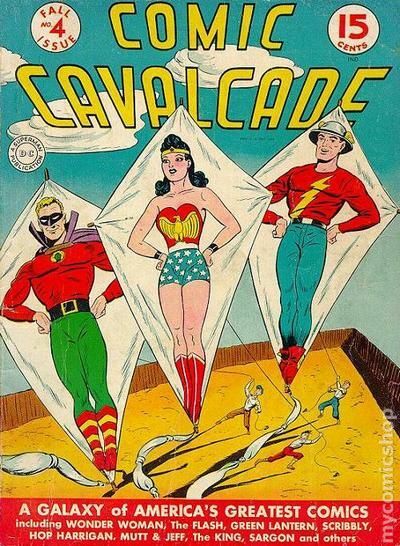 Published Sep 1948 by DC. Cover pencils by Irwin Hasen, inks by Bob Oksner. The Sinister Countess Hatra, script by Robert Kanigher, art by Harry G. Peter; The Princess of Pogolana's life is in danger after her father is overthrown by her cousin. When she returns home, only Wonder Woman can save her from death. Mutt and Jeff strips by Al Smith (signed as Bud Fisher). The Treasure of Diaz starring Johnny Peril, script and art by Howard Purcell. The Treasure of Plateau City starring Green Lantern, script by Robert Kanigher, art by Alexander Toth; WXYZ Radio is asked to broadcast Plateau City's centennial of its first gold strike, but a criminal band is on hand to relieve the city of its gold by spreading rumors of a new gold strike! National Thrift Week-Open a Bank Account starring Cotton-Top Katie, script and art by Harry Lampert (signed as Harrielle). The Mystery of the Midway Tunnel starring The Atom, script by Joseph Greene, art by Carmine Infantino. The Flash Concerto, script by Robert Kanigher, pencils by Irwin Hasen, inks by Bernard Sachs. 80 pgs. $0.15. Cover price $0.15. Cover art by Irwin Hasen. The Machine of Schemes, script by Robert Kanigher, art by Harry G. Peter; Wonder Woman and Professor Calculus develop a super-computer thinking machine that can solve complex problems. But the machine is stolen by Crime-Brain Doone, who intends to use it to steal the gold in Fort Knox. Mutt and Jeff strips by Al Smith (signed as Bud Fisher). Cotton-Top Katie story, script and art by Harry Lampert (signed as Harrielle). Situation Wanted, pencils by Lee Elias, inks by Bob Oksner; Needing money to help finance the Gotham Charity Hospital, Green Lantern takes on a series of cases. The Last Man Alive starring The Flash, script by Robert Kanigher, pencils by Lee Elias, inks by Bernard Sachs. The Movie featuring Leave it to Binky, art by Ken Hultgen. The Lovely Lady starring Johnny Peril, script and art by Howard Purcell. 80 pgs. $0.15. Cover price $0.15. 3" spine split from bottom. Several pages detached. Additional pages loosening at spine. Contents change from super-heroes to funny animals with this issue. Ants! Ants! Millions of Them! starring Fox and Crow. Mum's the Word! starring Blabber Mouse, art by Rube Grossman. Throckmorton's Big Family Reunion starring Tortoise and the Hare, art by Rube Grossman. Mind Uncle Percy starring Raccoon Kids, art by Otto Feur. Ulp! Broadway!! starring Dodo and the Frog, art by Otto Feur. Law of Mirrors starring Goofy Goose, art by Rube Grossman. The Oyster Who Couldn't Sing starring Giggle-Toons, art by Howie Post. General Doorman starring Willy Wolf, art by Ed Dunn. Harmnun and Gaily Circus starring Nutsy Squirrel, art by Rube Grossman; The Mayor threatens to close the circus unless they can make him laugh. 76 pgs. $0.15. Cover price $0.15. Tonight is Chistmas Eve starring Fox and the Crow, art by Jim Davis. A Blabber Mousetrap, art by Rube Grossman. Free Rides starring the Raccoon Kids, art by Otto Feuer. Throckmorton Turtle a Success Again starring Tortoise and the Hare, art by Rube Grossman. What's the idea reciting poetry? 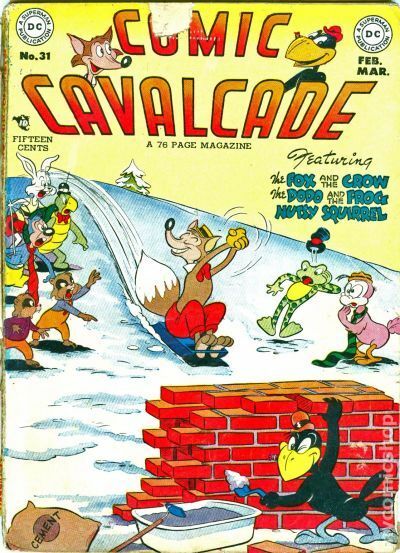 starring Goofy Goose, art by Rube Grossman; Goofy decides to be a poet and goes digging for rhymes. Squirrels Can't Talk starring Nutsy Squirrel, art by Rube Grossman; The Professor tries to convince Nutsy that squirrels can't talk. The rewards of thrift starring Chick 'n Gumbo, art by Howie Post. House to Share starring Duffy. Here we go gathering nuts in May starring Nip And Chip, art by Otto Feuer. From this day forward I'm going to reform starring Dodo and the Frog, art by Otto Feuer. 76 pgs. $0.15. Cover price $0.15. 2 1/2" spine split form bottom. Today is Valentine's Day starring Fox and Crow, art by Jim Davis. The Trojan Cheese starring Blabber Mouse, art by Rube Grossman; Tomcat tries get into the mouse hole by hiding in a piece of cheese. Mugsy the Tough Mole starring the Raccoon Kids, art by Otto Feuer; Mugsy desperately tries to prove he's a tough guy. The Society Flower Show starring Joe Kangaroo, art by Otto Feuer; Joe has to take pictures at a flower show. The $20 Auto starring Richut. The Magnet starring Nutsy Squirrel, art by Rube Grossman. Goofy Goose's Swimming Pool, art by Rube Grossman. Let's Be Friendly starring Willy Wolf, art by Ed Dunn. Frogs Is Ignerant starring Dodo and Frog, art by Otto Feuer. 76 pgs. $0.15. Cover price $0.15. Large piece torn from back cover. Little Feathered Friend starring The Fox and the Crow. People get sunburned... featuring Ma Nature's Curiosity, art by Martin Naydel. Muffling the Cat starring Blabber Mouse. The Grief of Bagdad starring Funny Fez. Whiffletree's Sun Spot starring Goofy Goose. The Boy Scout starring Nutsy Squirrel. The Peace Officer starring J. Rufus Lion. The Photographer starring Willy Wolf. Amateur Night starring Nip and Chip. The Weatherman starring The Dodo and the Frog. 76 pgs. $0.15. Cover price $0.15. Jack and the Beanstalk starring Fox and Crow, script by Hubie Karp, art by Jim Davis. Hypnotism in 10 Easy Lessons starring Blabber Mouse, art by Rube Grossman. The Ferocious Slurch Gang starring The Raccoon Kids, art by Otto Feuer. A Gorgeous Day For Golf starring Goofy Goose, art by Rube Grossman. 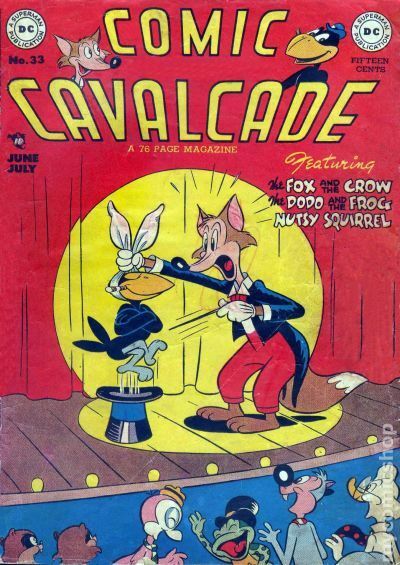 The Prize fight starring Roly and Poly, art by Rube Grossman. Safety First public service announcement starring Superman, script by Jack Schiff, art by Win Mortimer. Tuesday is my favorite season starring Dodo and the Frog, art by Otto Feuer. Mirror Image starring Ozzie Owl, art by Rube Grossman. Children's Day starring J. Rufus Lion. The Invisible Mouse starring Doodles Duck, script and art by Howie Post. The Cuckoo Clock starring Nutsy Squirrel, art by Rube Grossman. 76 pgs. $0.15. Cover price $0.15. I just come to show ya me pieces of bread! starring Fox and the Crow, art by Jim Davis. The Reward starring Blabber Mouse, art by Rube Grossman. The Squeeler starring Raccoon Kids, art by Otto Feuer. 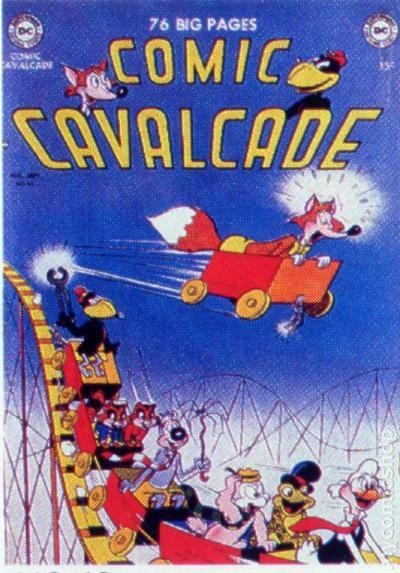 Winning a Car starring Goofy Goose, art by Rube Grossman. Danny Dummox starring Roly and Poly, art by Rube Grossman. Carmen Round The Mountain starring Dodo and the Frog, art by Otto Feuer; loosely based on the opera. I'll take you for a ride in my new boat starring Ozzie Owl, art by Rube Grossman. Treasure Map starring Sweeney and Willie. The Gorilla Who Changed His Mind starring Giggle-Toons, art by Howie Post. Be A Ventriloquist. 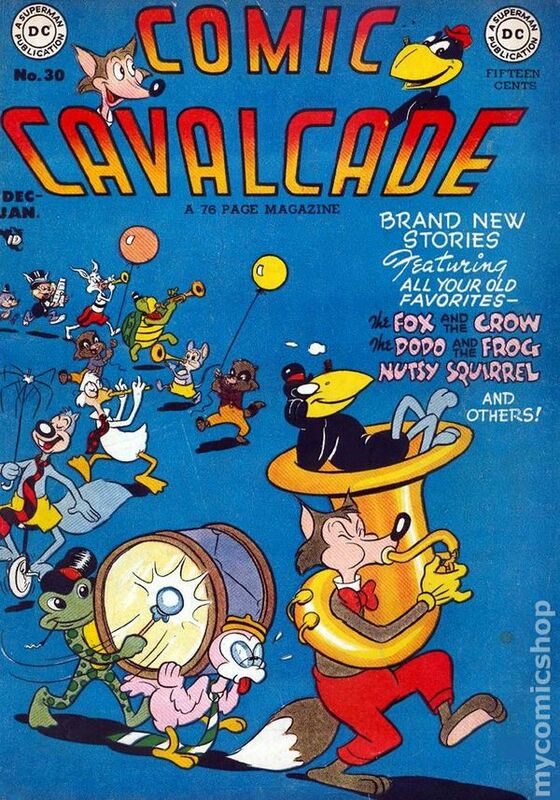 Buy a Dummy starring Nutsy Squirrel, art by Rube Grossman. 76 pgs. $0.15. Cover price $0.15. 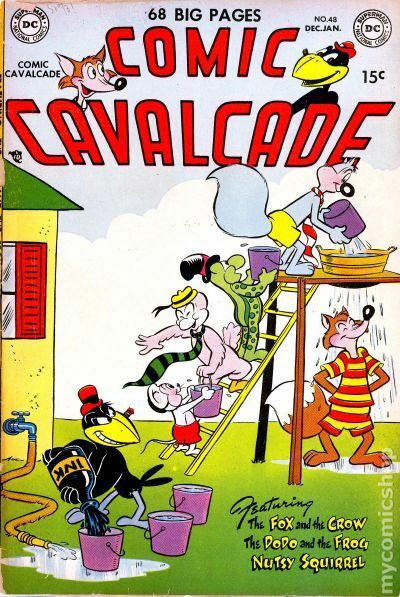 Houses are hard to get these days starring the Fox and the Crow, art by Jim Davis; Crawford tries to buy Fauntleroy's house and sell it at a profit. Shut Your Cakehole starring Blabber Mouse, art by Rube Grossman. The Tuscan Mob starring Raccoon Kids, art by Otto Feuer. Get off my sunny spot! starring J. Rufus Lion, art by Howie Post. Have you seen my son? starring Dodo and the Frog, art by Otto Feuer. Shep, Sheep! What's the Difference? starring Doodles Duck, art by Howie Post. Men for the Pharoah starring Funny Fez. The Tree That Branched Out starring Giggle-Toons, script and art by Howie Post. The Seven Professors starring Nutsy Squirrel, art by Rube Grossman; The seven professors try to invent ways to burglar proof their house. 76 pgs. $0.15. Cover price $0.15. INCOMPLETE. Multiple pages missing. Interrupts art and story. 1 1/2" Cumulative spine split. Cover art by Rube Grossman. What an odor! starring Fox and the Crow, art by James F. Davis; The Fox invents a chemical that makes anything taste delicious. I just picked up Tom Cat on the radar screen! starring Blabber Mouse, art by Rube Grossman. Some flying, huh? starring Raccoon Kids, art by Otto Feuer. Scientists claim there is gold in the ocean starring Dodo and the Frog, art by Otto Feuer. Ye Ozzie Owl General Store, art by Otto Feuer. Oh Boy--- Jelly Beans! Yummy! starring Nip and Chip, art by Otto Feuer. Stand Up For Sportsmanship public service announcement starring Batman and Robin, script by Jack Schiff, art by Win Mortimer. Choose me in! 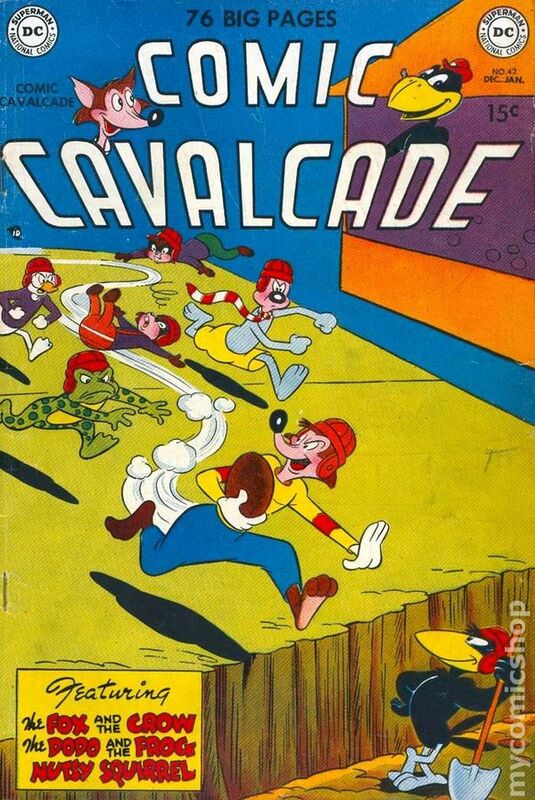 starring Goofy Goose, art by Rube Grossman. Curiosity Killed the Cat starring Nutsy Squirrel, art by Rube Grossman. 76 pgs. $0.15. Cover price $0.15. That harp music simply sends me! starring Fox and the Crow, art by James F. Davis. Push This Button starring Blabber Mouse, art by Rube Grossman. I guess you're wondering why this lowly cabbage has replaced my customary derby hat! 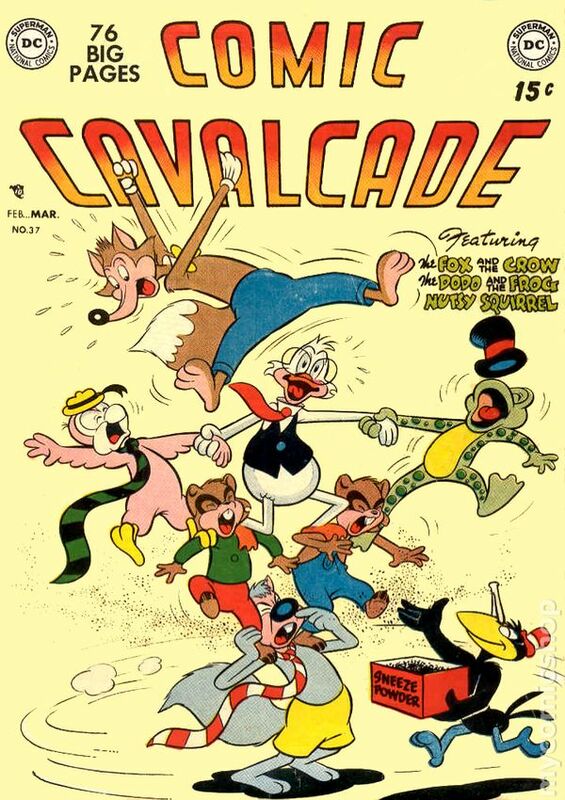 starring Roly and Poly, art by Rube Grossman; Dizzy tries to change his name. Cheepy, art by Otto Feuer. Natural History starring Dodo and the Frog, art by Otto Feuer. Strawberries starring J. Rufus Lion. A Penny For Your Thoughts starring Pete The Pup, art by Otto Feuer. Zee great art show is tomorrow! 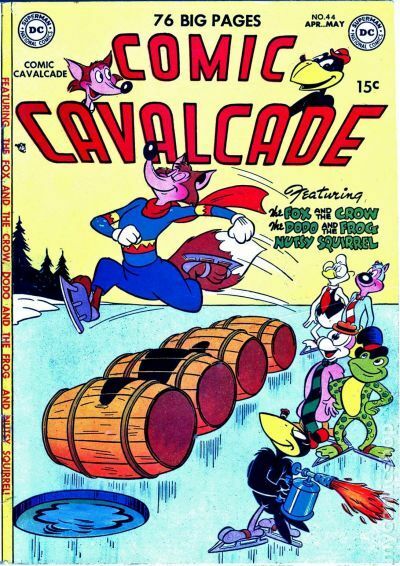 starring Goofy Goose, art by Rube Grossman. No Vacancies starring Custer Cat and Cheesy the Mouse, art by Rube Grossman. Nutsy At the Bat starring Nutsy Squirrel, art by Rube Grossman. Code For Buddies public service announcement starring Superman, script by Jack Schiff, art by Win Mortimer. 76 pgs. $0.15. Cover price $0.15. 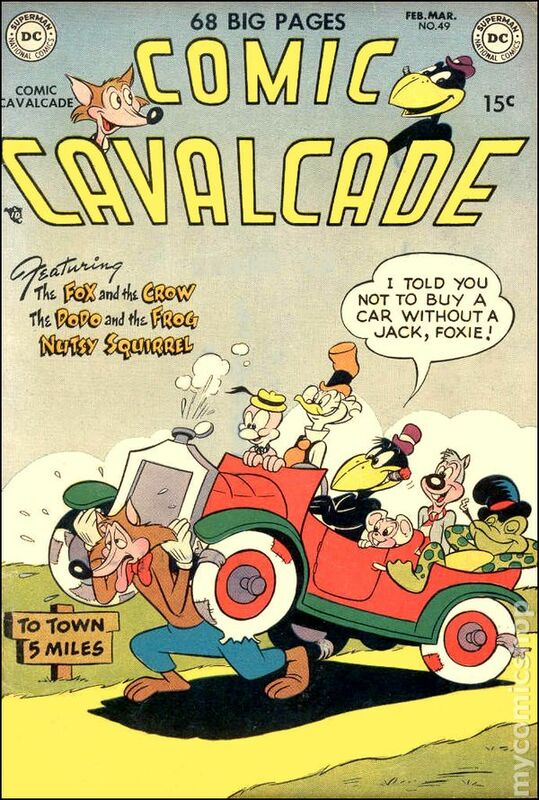 Dis isn't the biggest 1950 model jalopy, but it's neat starring Fox and the Crow, art by Jim Davis. Buggy's Manager starring Raccoon Kids, art by Otto Feuer. Leaving Home starring Blabber Mouse, art by Rube Grossman. I'm going bird watching starring Custer Cat and Cheesy the Mouse, art by Rube Grossman. Sea horsing around starring Dodo and the Frog, art by Otto Feuer. How To Be Smart starring J. Rufus Lion, art by Howie Post. Wailings and whimperings and all kinds of tears! starring Nip and Chip, art by Otto Feuer. A funny book is making you cry? But Why?? 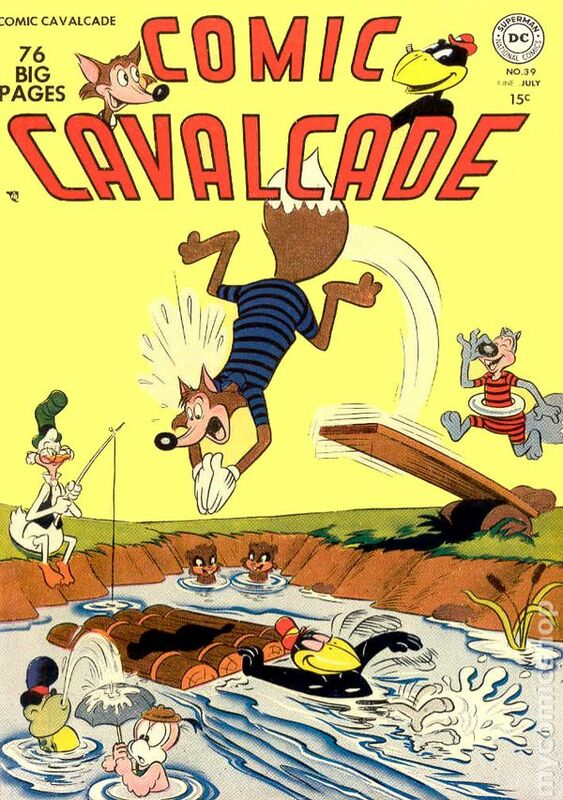 starring Goofy Goose, art by Rube Grossman. Nutsy's New Hat starring Nutsy Squirrel, art by Rube Grossman. Salute to the Boy Scouts of America public service announcement starring Superman, Batman, and Robin, script by Jack Schiff, art by Win Mortimer. 76 pgs. $0.15. Cover price $0.15. The Ice Cream Man starring The Fox and the Crow, art by Jim Davis. Keeping a Secret starring Blabber Mouse, art by Rube Grossman. 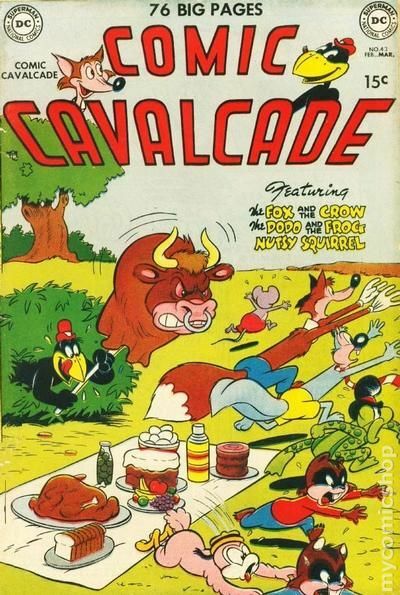 Picnic Time starring Custer Cat and Cheesy the Mouse, art by Rube Grossman. It's My Birthday starring Nip and Chip, art by Otto Feuer. Battling Bascom starring The Dodo and the Frog, art by Otto Feuer. An Easy Ten Bucks starring Doodles Duck, art by Sheldon Mayer. Biggety the Great starring Biggety Bear, art by Rube Grossman. Trapping the Mice starring Ruff and Reddy. Jailbird starring Goofy Goose, art by Rube Grossman. Paint Job starring Nutsy Squirrel, art by Rube Grossman. Superboy: Job Counselor public service announcement, script by Jack Schiff, art by Win Mortimer. 76 pgs. $0.15. Cover price $0.15. Dullest day I ever spent! 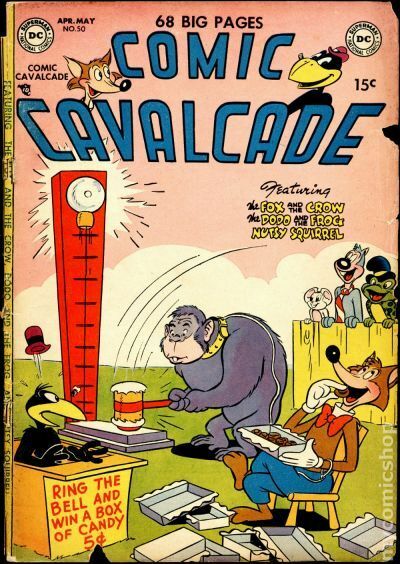 starring Fox and the Crow, art by James F. Davis; Crawford disguises himself as a chimpanzee and tells Fauntleroy there's a reward for his capture. 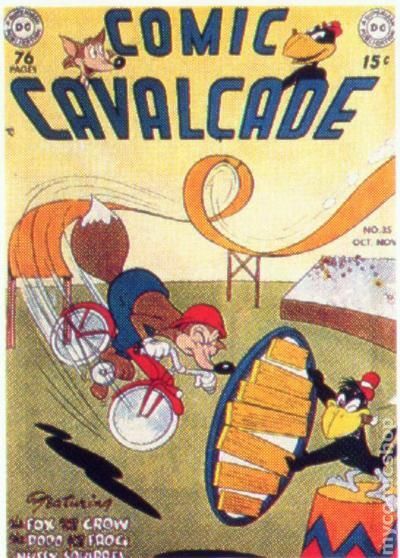 T. Wellington Alleycat starring Blabber Mouse, art by Rube Grossman. Magic Elixir starring Custer Cat and Cheesy the Mouse, art by Rube Grossman; Custer and Cheesy get mixed up with a side show flimflam man. Stay away from Dizzy starring Bo Bunny, art by Sheldon Mayer. 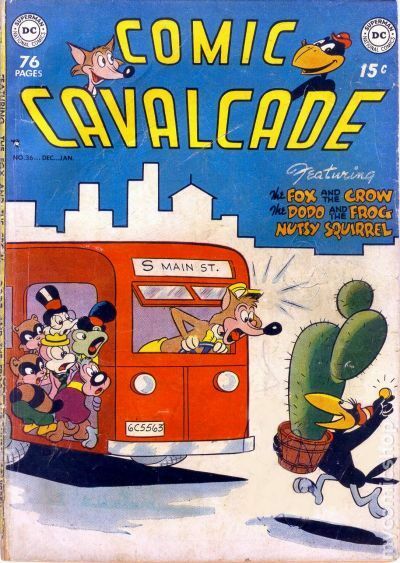 Waiting for a color I like starring Goofy Goose, art by Rube Grossman. Dumbest Man in the World starring Dodo and the Frog, art by Otto Feuer. The Talking Car starring Doodles Duck, script and art by Sheldon Mayer. Famous Heroes starring Bernard the Brave, art by Otto Feuer. Target Shooting starring Li'l Chick-A-Dee, script and art by Sheldon Mayer. Please get a pencil ready!!" 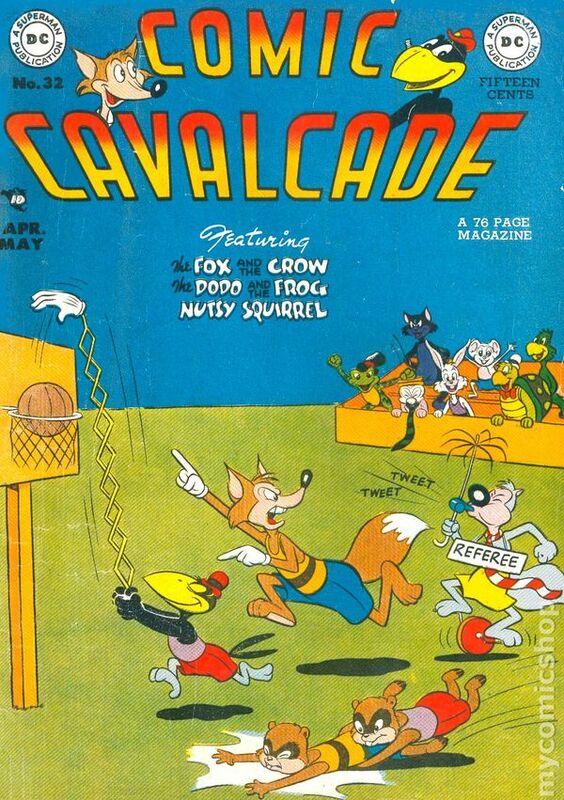 starring Nutsy Squirrel, art by Rube Grossman. 76 pgs. $0.15. Cover price $0.15. Cover art by Rube Grossman. Hiya Foxie! ["Where are youse goin'? To the grocery store"] starring Fox and the Crow, art by Jim Davis. ["Oboyoboy! We sure were lucky to find this $5 bill!"] starring Roly and Poly, art by Rube Grossman. Captain Tootsie Cheers Orphans Tootsie Pops ad by Bill Schreiber. ["Gosh! What silly animals you read about in comic books!"] starring Bo Bunny, script and art by Sheldon Mayer. ["Hmph! This is the day of the big ball game"] starring Dodo and the Frog, art by Otto Feuer. ["Come back here, you runt!"] starring Blabber Mouse, art by Rube Grossman. ["Well, I've got the plan of my new house"] starring Raccoon Kids, art by Otto Feuer. ["Look, Butch, a fortune teller!"] starring Rube the Rodent, art by Rube Grossman. The World of Adventure in Books public service announcement starring Green Arrow, script by Jack Schiff, art by Win Mortimer. 76 pgs. $0.15. Cover price $0.15. Cover art by Rube Grossman. ["My fires gone out!"] 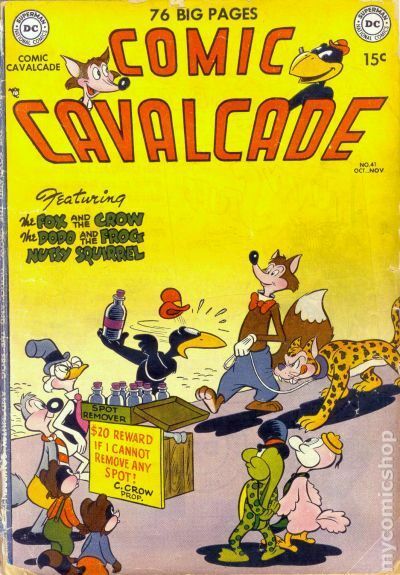 starring Fox and the Crow, art by James F. Davis; Crow tries to scam coal from the Fox. The Cubs' New Job starring Blackie Bear, art by Rube Grossman. Dinner at the Diner starring Doodles Duck, script and art by Howie Post; Doodles and Buttons get jobs at a diner. Shine? starring Dodo and the Frog, art by Otto Feuer. The Actor starring Goofy Goose, art by Rube Grossman. ["Gee, it's raining hard, Bo! Let's find a place to spend the night!"] starring Bo Bunny, script and art by Sheldon Mayer. The Letter] starring Blabber Mouse, art by Rube Grossman. ["absolute quiet"] starring Nutsy Squirrel, art by Rube Grossman. Paramouse Studios starring Custer Cat and Cheesy the Mouse, art by Rube Grossman; Custer and Cheesy try to get a job as a stuntman. Human Rights for All public service announcement starring Superman, script by Jack Schiff, art by Win Mortimer. 76 pgs. $0.15. Cover price $0.15. [The Fox meets the Sandman] starring Fox And Crow; When the Fox can't sleep, the Crow pretends to be Morpheus, the Sandman. The Radio Business, art by Otto Feuer; The Frog tries to sell the Dodo a broken radio. Jimmie Mouse is Coming Home starring Blabber Mouse, art by Rube Grossman. Dumb Lessons starring Bo Bunny, script and art by Sheldon Mayer. Looking for Gold starring J Rufus Lion, script and art by Howie Post. New Playroom starring Doodles Duck, script and art by Sheldon Mayer. 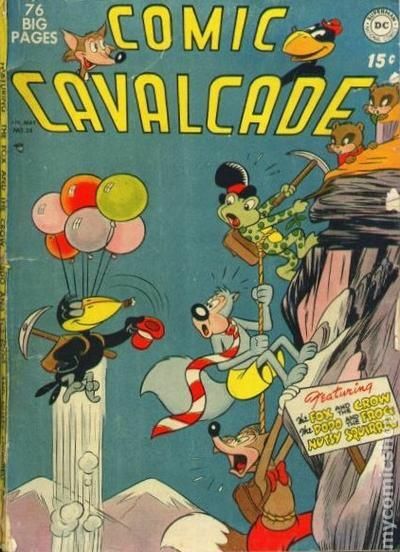 Treasure Guards starring Custer Cat and Cheesy Mouse, art by Rube Grossman. Fishing Trip starring Nutsy Squirrel, art by Rube Grossman. Mine's Nicer starring Dizzy Dog, script and art by Sheldon Mayer. Know Your Country public service announcement starring Superboy, script by Jack Schiff, art by Win Mortimer. 76 pgs. $0.15. Cover price $0.15. F. Fox's Treasure Expedition starring Fox And Crow. Happy Birthday, Jimmie! starring Blabber Mouse, art by Rube Grossman. Did You Ever Get Real Tired of Your Friends? starring Bo Bunny, script and art by Sheldon Mayer; Bo gets sick of being a comic character and moves to the real world. Out to Seagull Island to Hunt For Pirate Treasure starring Raccoon Kids, art by Otto Feuer. ["A few puffs of smoke into this old can and Presto! I'm in business!"] starring The Dodo and the Frog, art by Otto Feuer. Say, Doodles Can I Borrow Your Hammer? starring Doodles Duck, script and art by Sheldon Mayer. Aaah -- Peace and Quiet! How I Love It" starring J. Rufus Lion. ["I like flowers! I don't like Carrots!"] starring Tortoise and the Hare, art by Rube Grossman. Pierre Van Hare World's Greatest Artist starring Goofy Goose, art by Rube Grossman. My Wife Ordered a Beach Chair! starring Nutsy Squirrel, art by Rube Grossman. 8 Walt Disney Comic Books Wheaties ad. 76 pgs. $0.15. Cover price $0.15. F. Fox's Rest Haven starring Fox and the Crow, art by James F. Davis; The Fox opens a rest home. ["A lot of berries"] starring Raccoon Kids, art by Otto Feuer. ["A lot of berries"] starring Raccoon Kids, art by Otto Feuer; Presto decides to get out of the magic business. Squawking to the Dog starring Flippity and Flop, art by James F. Davis. Yow! A Falling Leaf! 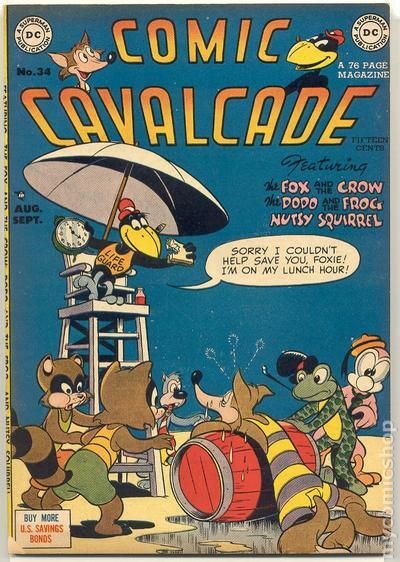 starring Nutsy Squirrel, art by Rube Grossman. ["A Skiing we will go"] starring Dizzy Dog, script and art by Sheldon Mayer. The Bunny Who Looked Funny starring Giggletoons, script and art by Howie Post. Side Show starring Bagby Bear. Fennimore's Travels starring Dodo and the Frog, script by Woody Gelman, art by Otto Feuer. 76 pgs. $0.15. Cover price $0.15. "Look at the cobwebs on Foxie's Front Door!" starring Fox and the Crow, art by James F. Davis; Foxie hasn't slept for weeks because he's guarding his prize cow. "Hi Harry! How Do you like my new car?" starring Tortoise and the Hare, art by Rube Grossman. Bubbles Bear starring Dizzy Dog, script and art by Sheldon Mayer. Partridge Hunting starring Fraidy Cat, art by Otto Feuer; the boys want to go partridge hunting but Fraidy is scared of partridges. Having a Party starring Dodo and the Frog, art by Otto Feuer. "What a day for a dip!" starring J. Rufus Lion, script and art by Howie Post. Louella Snow starring Pinky and Winky, art by Rube Grossman. New Television Set starring Doodles Duck, script and art by Sheldon Mayer. Mrs. Thrush's Party starring Nutsy Squirrel, art by Rube Grossman. 68 pgs. $0.15. Cover price $0.15. The Movie Business starring Fox and the Crow, art by James F. Davis. Hiccups starring Fraidy Cat, art by Otto Feuer. The Cheesebake starring Blabber Mouse, art by Rube Grossman. Welcome to Simpville starring Bo Bunny, script and art by Sheldon Mayer. Picnic starring Dodo and the Frog, art by Otto Feuer. There's the Stagecoach starring Buff and Bobo. You need this Proverb Book! 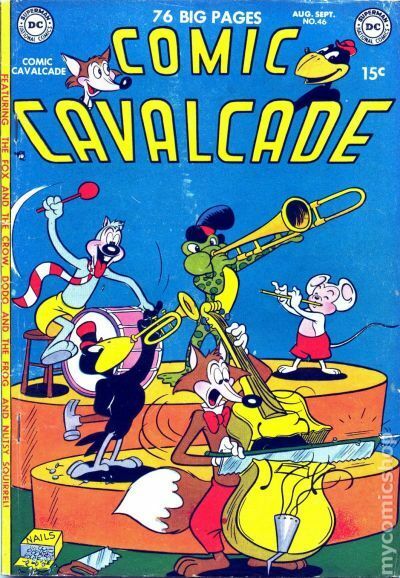 starring Custer Cat and Cheesy the Mouse, art by Rube Grossman. The Music Stand starring Doodles Duck, script and art by Sheldon Mayer. The Fountain of Knowledge starring Nutsy Squirrel, art by Rube Grossman. One-page Tootsie Roll ad, "Captain Tootsie Saves the Sailplane" by C.C. Beck and Pete Costanza. 68 pgs. $0.15. Cover price $0.15. Interior is complete. Centerfold detached. Extensive accumulation of defects. "Sunshine! Sunshine! I must have sunshine!" starring Fox and the Crow, art by James F. Davis. Cracking Up starring Blabber Mouse, art by Rube Grossman; Tom Cat decides to resign from being a cat because he can't catch the mice. Blabber suggests he become a mouse instead. The Race starring Tortoise and the Hare. Championshio Football Game starring Pinky and Winky, art by Rube Grossman; Pinky and Winky try to sneak into the football game. "These Flies ought to do it" starring Blackie Bear. Gala Party of the Science Club starring Dodo and the Frog, art by Otto Feuer. Bernard the Brave story, art by Otto Feuer. "Here Comes Muggsy with a Big Watermelon" starring the Raccoon Kids, art by Otto Feuer. "My Grandpa's Old Eye Glasses!" starring Doodles Duck, script and art by Sheldon Mayer. "Would You Like to Buy a Vacuum Cleaner?" starring Dizzy Dog, script and art by Sheldon Mayer. "Have some crackle popsies!" 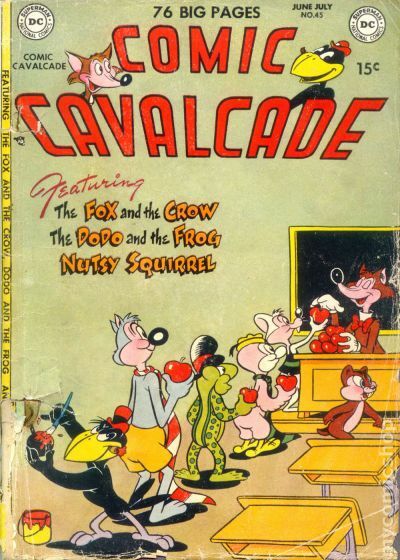 starring Nutsy Squirrel, art by Rube Grossman. 68 pgs. $0.15. Cover price $0.15.